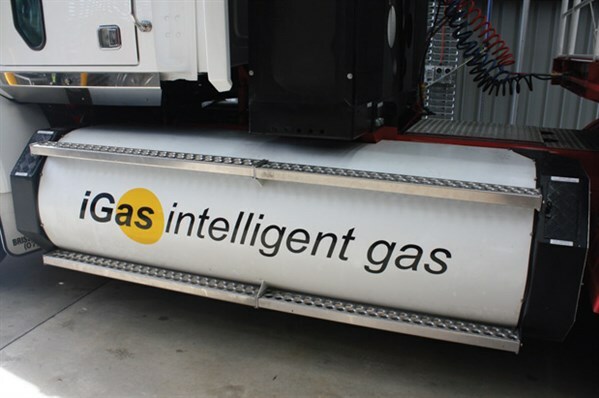 As demand for natural gas grows overseas, Australian company iGas continues to develop its heavy-duty CNG solution. Matt Wood catches up with the latest incarnation of the company’s Westport CNG-powered prime mover. 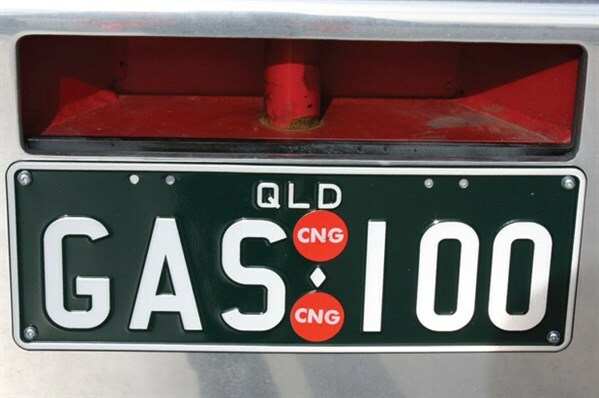 Queensland-based company iGas Energy has been plugging away at a cost-effective and practical heavy-duty compressed natural gas (CNG) concept for over two and half years now. CNG is an attractive gas alternative. For a start, it’s cheaper and doesn’t require the energy-intensive cooling process that LNG does. It’s also more stable. As it’s a gas, it doesn’t need to stay cool like LNG does, if you park a CNG vehicle, the fuel just stays put until you start it again. Arguably CNG is safer than LNG as it is lighter than air and will dissipate more quickly. In an accident there’s no chance of the dreaded ‘boiling liquid expanding vapour explosion’ (BLEVEY) that the media love to associate with LNG, however unlikely that scenario may be. The downside of CNG is that it does tend to take up a lot more room on the chassis of a road-going truck. Another issue has been that most CNG truck engines use spark ignition, where the diesel injectors are replaced with spark plugs and this causes a loss in horsepower and torque. For this reason, to date, most CNG applications have been restricted to city-based light- and medium-duty trucks that don’t need the torque or the horsepower that a heavy-duty vehicle does. iGas has been trialling its own CNG adaptation of the 15-litre Westport HPDI LNG engine; this system has the same 95 per cent substitution rate that the LNG version has and still uses a fine mist of diesel for combustion. Over this time, iGas has had two Western Star prime movers working for a national transport company under real working conditions and has been gradually streamlining its CNG package. Recently iGas demonstrated the third and latest incarnation of the CNG Westport engine installed in a Western Star 4800FX prime mover. The original versions of the gas engine used a concept rather clunkily named PLIGATS which stands for ‘pressurised liquid gas transfer system’. 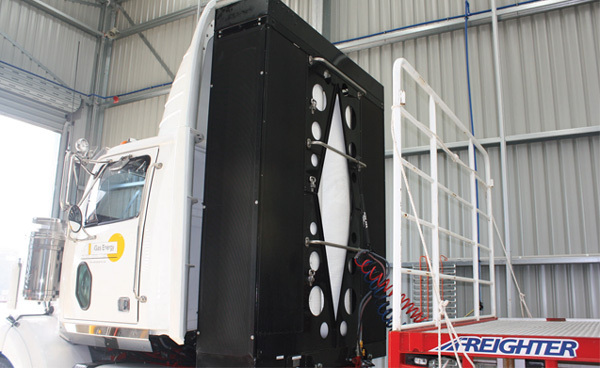 The PLIGATS system used a water-based hydraulic liquid to force CNG out of the carbon fibre storage tanks and into the Westport engine. The pressure for this came from a Vickers 20/20 hydraulic pump that handled power steering duties for the prime mover as well. The main downsides of the original system were a lack of range with a realistic operating range of nearly 1,000km. 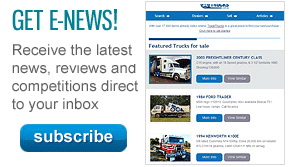 I drove the original PLIGATS version last year and found the performance and drivability of the truck identical to an equivalent spec Cummins ISX powered prime mover. The new version of the iGas system has done away with the cumbersome hydraulic gas injection system which has been replaced by a gas booster or compressor that is powered by the same Vickers pump as the outgoing version. The booster pushes the CNG into the engine at 300 barg, which is around 4,400psi, on top of atmospheric pressure which puts it into the ball park of 5,000psi. Energy density climbs exponentially at the 5,000psi mark. Another development has been in the area of cylinder design with the availability of 100 inch (2,540mm) x 26 inch (660mm) carbon fibre tanks. The larger tanks now give the iGas truck a potential range of 1,500km. 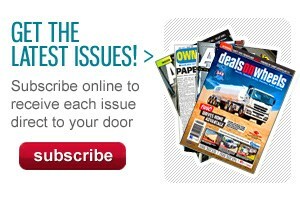 iGas Executive Director, Derek Fekete ran me through some of the key areas of the new set-up. "We now have the only known trailer that’s actually registered as a gas vehicle," he says, as we walk around the truck. Fekete is referring to the fact that because the trailer carries some of the truck’s gas it needs to be registered as such. On the company’s choice of 15-litre Westport HD550 High Pressure Direct Injection engine, Fekete states: "The Westport LNG engine has proven reliability in Australia now, there are 40 on the road here in Australia, with the oldest now having racked up 1.3 million kilometres in Western Australia." There are now over 1,000 Westport engines operating globally according to Fekete. Gas engines tend to run quieter and also cleaner as the gas doesn’t generate any soot which also leaves potential for extended oil drain intervals; from 60-80,000km. Fekete goes on to point out that the engines run that clean that the ADR80/02 engines come within a whisker of satisfying ADR80/03 without any after treatment. iGas is also claiming a world first as a 5,000psi heavy-duty CNG solution. There is however, a weight penalty of 1,400kg over standard equivalent spec diesel prime mover. The CNG Western Star 4800FX prototype has an Eaton Autoshift 18-speed transmission. The demonstration took place at the Wodonga TAFE, National Industrial Skills Training Centre (NISTC) at Barnawartha, Victoria. It was a chance to have a closer look at some of the new features that iGas has applied to their concept. Nothing has changed a great deal mechanically; the biggest advances have been in the storage and delivery of the gas to the engine. 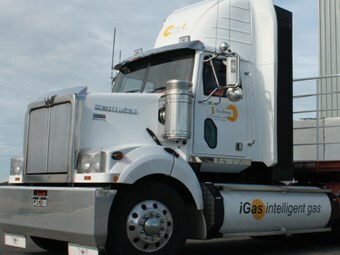 But iGas has also found a way to increase vehicle range even more by installing belly tanks in their step deck trailer. The distance of the on-vehicle storage from the prime mover isn’t an issue in terms of fuel delivery with the tanks connected to the prime mover via quick release fittings on the chassis of the prime mover behind the turntable. Theoretically there’s no reason that a B-double or road train couldn’t have belly tanks under each trailer to increase range even further. I had a chance to climb behind the wheel of the Western Star demo truck, and with its counterweighted trailer and performance-wise there’s little to report — it drives pretty much like the old one which drove pretty much like any other Cummins ISX powered 4800 I’d ever driven, 550hp (411kW) and 1850ft-lb (2,509Nm) of torque. That’s a good thing; the only real noticeable difference is the quiet, somewhat subdued exhaust note of the HD550 engine. But what was startling was the fuel bill from the truck’s 1,200km journey down from Yatala, Queensland to Canberra via Wollongong. When refuelling in Canberra the bill came to a paltry $330, that’s pretty bloody cheap trucking. iGas Chairman, Jim McDonald reckons that "there’s potential fuel savings in the vicinity of $150,000 a year at current gas prices". But what is worthy of closer attention is the refuelling infrastructure that iGas also manufacture. This uses the hydraulic PLIGATSsystem that used to be on the trucks and speeds up the notoriously slow refuelling time considerably, a common complaint with CNG. The ChillFill process used on the iGas refuelling station drops the gas temperature to sub-zero to ensure that maximum fuel capacity is achieved. But all of this aside, the iGas system does have the potential to give operators more power over their fuel supply chain. If you consider that the ChillFill station is pretty much just plumbed into a gas pipeline like a stove or hot water service, the fleet operator can negotiate a metered rate from the mains and cut out retailing and delivery hassles and charges. As with many Australian innovations, the iGas system will most likely realise its potential on foreign shores. The company now has four United States-based employees and is currently talking to some US rail operators with a view to adapting the concept to rail locomotives. One example of the gas boom in the US is the recent announcement that American logistics giant, Swift, with its 27,000-strong fleet is in the process of installing natural gas refuelling points in its depots.